Yes, it's true, I l-o-v-e, love bacon. After all my recent pontificating about eating less meat, I couldn't resist this Lithuanian recipe for Bacon Buns. I mean really, if I have to fall off the veggie wagon, let it be to eat crispy bacon. Add caramelized onions, wrap the mixture in a butter-rich, egg-based yeast dough, bake to golden brown perfection and well, all the remorse one typically feels after blowing a lofty resolution is virtually non-existent. I refuse to repent. 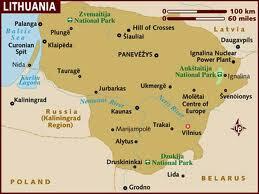 Once the largest country in Europe, Lithuania is the southernmost of the three Baltic states. Lithuania sits on the Southeastern shore of the Baltic Sea and borders Latvia, Belarus, Poland and the Russian enclave of Kaliningrad. This country is the first Soviet Republic to declare independence after being occupied by both the Soviet Union and then Nazi Germany. Lithuanian's cool climate is perfect for growing barley, potatoes, rye, beets, greens and mushrooms. Cuisine in Lithuania is influenced by Polish, Ukrainian, Scandinavian, Hungarian and Romanian traditions. Dumplings, donuts, crepes, pork and sausages are all enjoyed by Latvians in the beautiful Baltic country. Dice onion and bacon into very small, uniform pieces. In a large heavy skillet, saute bacon till it starts to crisp up and add onion. Continue cooking until onions are deep golden brown (do not burn!). Pour off some of the grease as you cook if needed. Meanwhile, in a 2 quart saucepan, heat milk, butter, sugar and salt to 120-130 degrees F until butter is melted. Pour off 1/2 cup of this mixture and dissolve the yeast in this 1/2 cup. Beat eggs and add slowly to remaining warm milk mixture. Pour entire mixture into bowl of a stand mixture and attach a paddle. Stir in sifted flour and beat vigorously. Add more flour very gradually if needed. Dough should be quite sticky, but not wet. Cover dough with a towel and let it rise in a warm place for about 2 hours. Punch down risen dough and refrigerate over night. Next day, roll out the dough to a thickness of about 3/8 inch. The dough is very soft, so use lots of flour while rolling out. Using a biscuit cutter or glass, cut rolled dough into rounds about 3-inches in diameter. Place a tablespoon of the bacon mix in the center of each round and fold the sides of the circle over the bacon. Use your fingertips dipped in water to seal the edges if needed. Place buns on lightly greased cookie sheet or parchment paper and allow the dough to rise again - about 2 hours if the dough is cold, 30-45 minutes if warm. Mix one egg yolk with 2 Tbsp. water and brush the top of each roll with the yolk mixture. Bake buns in the oven for 15-20 minutes. Final Assessment: This is a very rich dough, and of course, the addition of bacon makes it even more so. After making the first batch, I was instructed by the dudes in my house to "add more bacon!" which I did. These were delicious, sweet and savory rolls my kids scoffed down. I'm thinking they might be even better in the morning when the bacon flavor has permeated the rolls....we shall see!